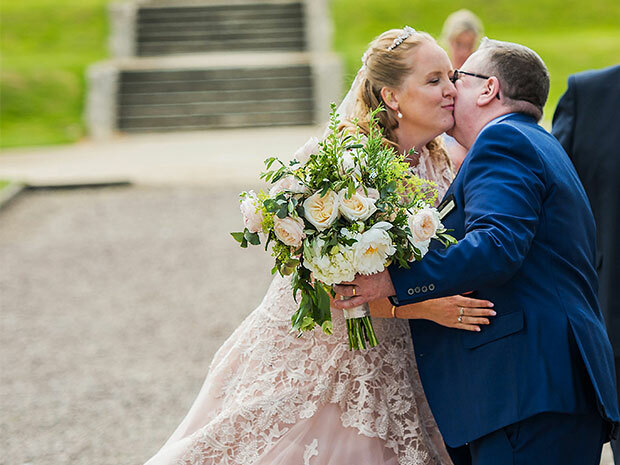 Following a first date by the seaside and surprise proposal, Sarah-Jane and David were married within the stunning setting of Dumbleton Hall, with special touches including Cornish fudge favours, a caricaturist and decadent cake. 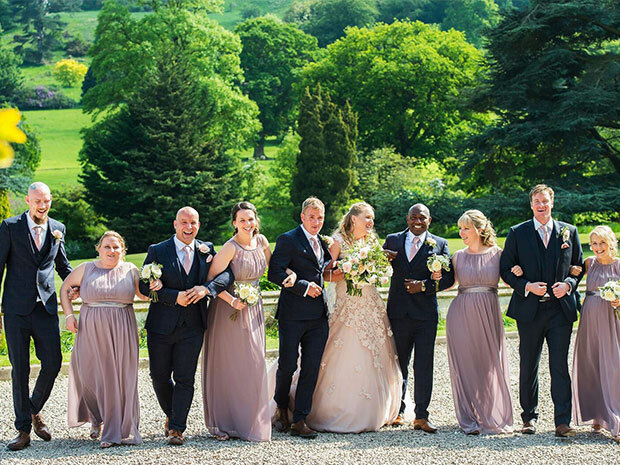 Sarah-Jane and David enjoyed a sunny celebration at Dumbleton Hall. 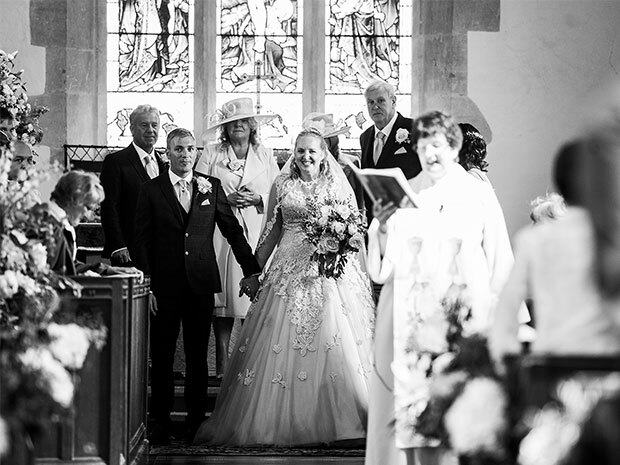 All images © Paul Willetts Photography. Bridal shoes: Ted Baker, oxblood velvet with rose gold and pearl embellishment, and Victorian lace up blush velvet boots for walking back from the church to the reception. Transport: Groom and groomsmen with Rise Helicopters, the bridal party in a classic Rolls Royce Silver Cloud III named Grace. Entertainment: Bellini Strings during the ceremony; Sound Plan band in the evening, booked through Entertainment Nation; and Tony's Toons providing caricatures of guests. Hair and beauty: Hair by Emma of Ell Hair Studio in Tewkesbury; make-up by Beauty Beyond in Winchcombe. Rings including engagement ring: An oval halo diamond engagement ring in platinum designed by the groom. Bride’s wedding band – simple platinum band. Groom’s wedding band – chunky gold centre with palladium border, engraved with the wedding date. It was a beautiful sunny October day and a memorable one. We had our first date in Falmouth by the sea. But it was almost the date that didn’t happen with both parties running late due to traffic chaos. SJ also managed to spill a bottle of water over herself on route and her car park ticket blew away! Despite such blips the date went ahead. David treated SJ to a delicious lunch in a small restaurant overlooking the sea. Following lunch they went for a coastal walk to Sarah-Jane’s favourite ice cream spot, and treated David to an enormous Cornish ice cream. David had been away on army training and had arranged for SJ to come up one weekend. He booked the beautiful Frimley Hall Hotel, which was near to his training venue. David had planned to propose that weekend but, despite plenty of opportunities, felt nervous. As SJ was about to leave to get the train home a shoe box appeared; SJ turned around to see David with a ring! It was a surreal trip for SJ on the train home, staring at her ring. She celebrated with random strangers who purchased bubbles, which was a nice touch. It was almost ten months to the day. The mother of the bride’s organisational skills were second to none! 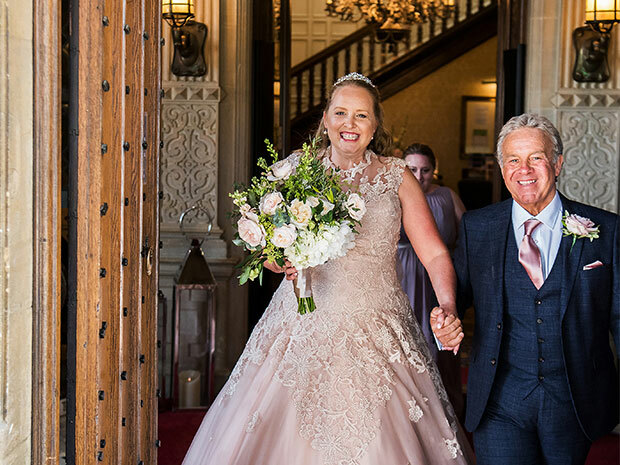 Dumbleton Hall has always been a special place for the bride and her family, and David fell in love with the place the first time SJ took him there. As soon as we were engaged we knew where we wanted to hold the special day and were fortunate a May Day was free. 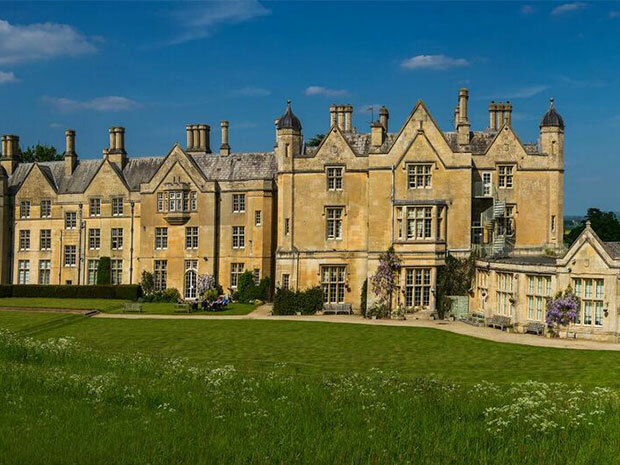 We’d had such wonderful weekends at Dumbleton, drinking bubbles lazing by the lake, exploring the gardens and surroundings that it was our first choice. 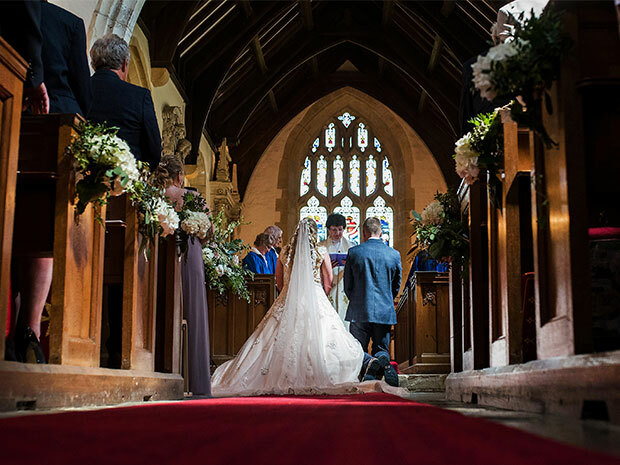 We knew we wanted to have a church wedding and Dumbleton Hall has a beautiful church on its doorstep. We attended services for six months so we could establish a local connection. The vicar, her PA and the congregation at St Peter’s Church, Dumbleton, could not have been more welcoming. 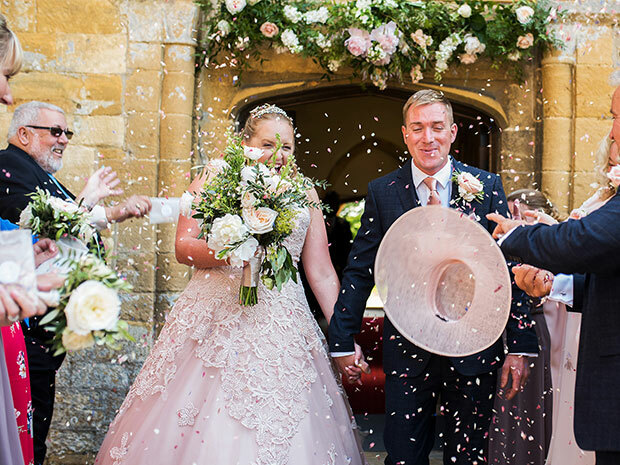 We didn’t have a theme, we just wanted an English country house wedding to be shared with our valued friends and loved ones, with an abundance of flowers to complement the beautiful gardens. When carrying out our initial research we kept on finding images we liked that linked back to Paul’s website. His images stood out from other wedding photographers. He made us giggle on the day and we felt at ease. The pre-wedding shoot also helped us to feel comfortable in front of the camera. Paul worked really hard all day and was constantly on the go. He is creative with his use of light and angles. Paul was like a guest at our wedding and wasn’t afraid to get stuck in… running around to get the best shots. How he managed to be everywhere to get all of the key shots / moments we’re not sure. We were afraid he was going to fall when he rushed down the stairs and ran into the fields to capture the groom’s helicopter landing. He is energetic and really works hard. 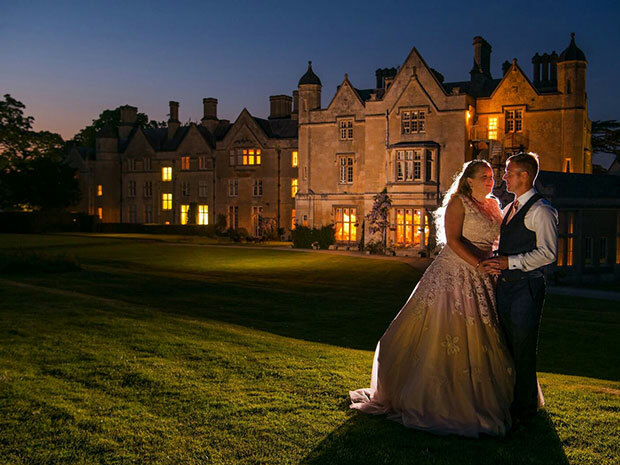 We are delighted with the way he has captured the essence of our wedding with beautiful shots. DIY affair, although the mother of the bride and bridesmaids should definitely think about changing their jobs, as wedding planning was discovered to be their forte! We had lists upon lists. As we live so far away from the venue we had to be organised. Travelling to the venue for church every month gave us the opportunity to tick different bits off the list after every visit. I knew it was the dress as soon as I saw it, in fact I only tried on three or four dresses in total. I was anxious about trying on dresses but the ladies who own Coastal Bridal were really welcoming. 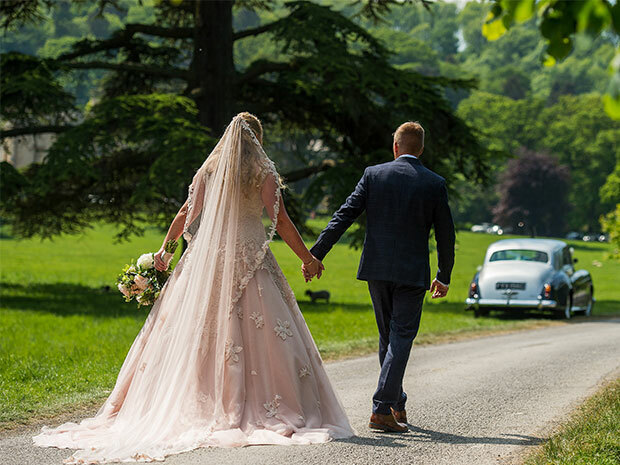 It was a Victoria Kay blush gown, with many layers of tulle and a delicate overlay of lace, together with a matching cathedral veil. I adored the colour which went well with my fair complexion. As soon as I tried it on I knew it was the one. I managed to keep the colour a secret and many people were pleasantly surprised, including the groom. He wore a navy check skinny three-piece suit with a silk blush tie, white shirt and brown Dune Brogues. I wore my great grandmother’s 1920s diamond engagement ring, leant to me by my mother. Old and borrowed – my great grandmother’s engagement ring. Blue – ‘I do’ in blue on the sole of my shoes, purchased by one of my bridesmaids. New – my dress and bridal jewellery (blush drop pearls with rose gold, Kate Spade rose gold bangle saying ‘Stop and smell the roses’, and a rose tiara from Ivory & Co.
Pachelbel’s ‘Canon in D’ performed by Bellini Strings, simply beautiful! 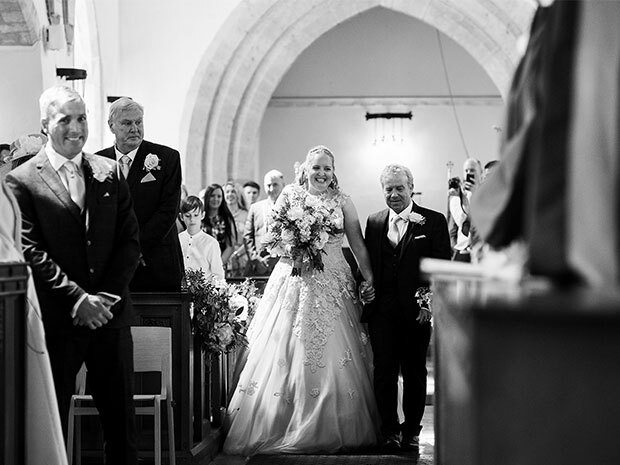 The bride asked Bellini Strings to stop whatever they were playing and play ‘I’m getting married on the morning’ when the groom entered the church, which helped the groom to relax. Sarah Brooks (bridesmaid) read ‘Instructions for Life in the New Millennium’ by His Holiness the 14th Dalai Lama. Malcolm Witheridge (great uncle) read from Colossians. poached pear and Roquefort cheese salad with walnut dressing. 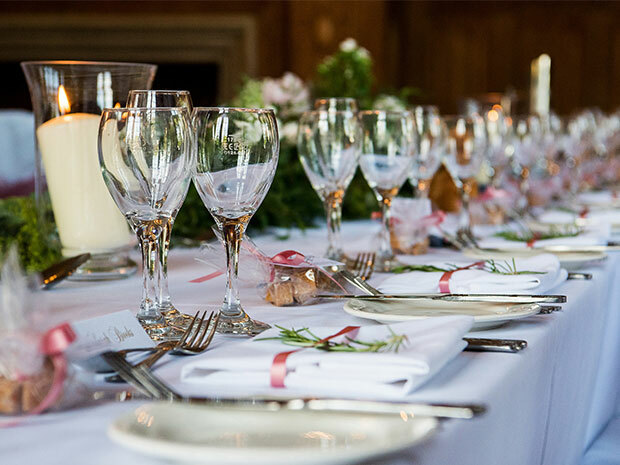 Mains – Roast beef fillet on brioche toast glazed with creamed mushrooms and chives; Barbary duck breast rubbed with spices and glazed with an orange elderflower sauce; or Red capsicum baked with wild rice, cashew nuts, apricots and feta cheese with a herb crust. Desserts – Jaffa cake pavê with orange sorbet; or Jammie Dodger cheesecake with strawberry ice-cream. We initially wanted a naked cake but then met Samantha of the Pretty Cake Company at a wedding fayre and her cakes blew us away. We therefore chose to have a more elaborate, iced, three-tiered cake. 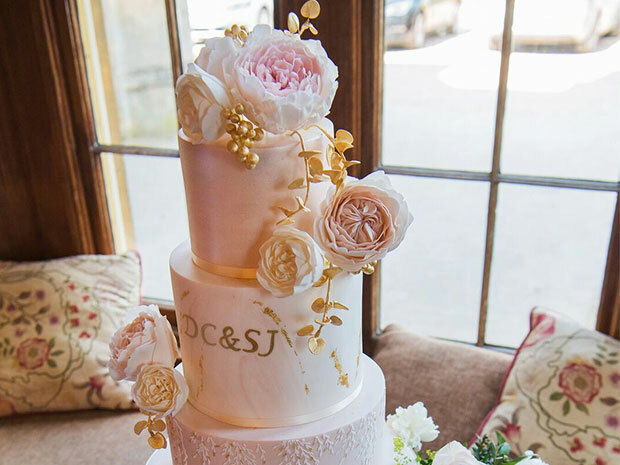 The cake was blush, with flicks of gold and beautiful intricate iced flowers. We chose chocolate brownie with salted caramel; lemon drizzle with elderflower cream; and carrot cake for the layers. It was simply delicious and we have saved the top layer which we look forward to eating soon. ‘Best Friend’ by Queen. We both have such different musical tastes that this was perhaps the most difficult decision for us. So hard to decide…can we say all of it? Every part of the day was special, the build-up, the anticipation, the ceremony and then the celebration afterwards. We enjoyed having so many friends and family around us to share our special day. From the bride’s point of view everything went to plan. But apparently the bride was late! The music stopped twice and the groom got told to stand up twice, thinking the bride had arrived… only for it to be the car with the future mother in law and bridesmaids. The groom must have looked nervous as he was offered (and accepted) a shot of whiskey from a member of the church choir! 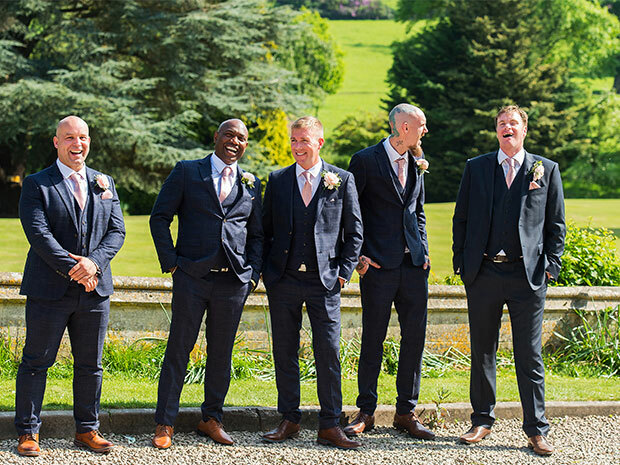 The best man joked that the bride wasn’t coming. Otherwise pretty much everything went to plan, we were very lucky! We had wonderful suppliers who were all amazing and did us proud. Make sure you do what you want to do, realise that there is a limit to how many people you can invite, and don’t feel bad about not being able to invite everyone – those who care about you will understand. Enjoy every second, take everything in and try not to feel overwhelmed. Just that everyone is there for you. You don’t need to fill every minute with entertainment. 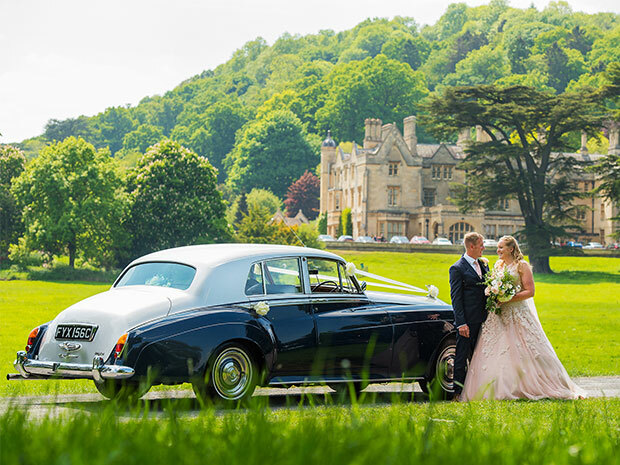 We had been at Dumbleton from the Thursday through to the following Monday, and when we had to leave to go on honeymoon we both found it difficult to leave, despite knowing we had fun adventures ahead! Once we got over leaving Dumbleton we flew out to the Seychelles. We stayed on some of the smaller islands which was literally paradise. An amazing part of the world, stunning beaches, breath-taking views and interesting wild life. After a fun day snorkelling and swimming off the beaches we would relax having cocktails in the shade of the mango trees. We were amused by the fruit bats above us feeding on the mangos, they seemed to smile at us. Due to this we didn’t fancy trying the local dish… fruit bat curry! 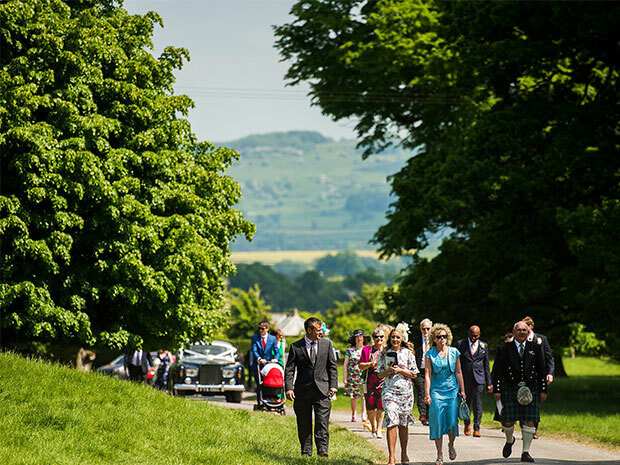 If Sarah-Jane and David’s wedding has inspired you, call (01386) 881240, email weddings.dumbletonhall@pofr.co.uk, or visit dumbletonhall.co.uk directly.